9 am to midnight (mid-June to early-September, Easter Weekend ans Spring Holidays). 9 am to 11 pm the rest of the year. 9 am to 6 pm on Mondays, Thursdays, Saturdays and Sundays. 9 am to 9.45 pm on Wednesdays and Fridays. Rooms begin closing 30 minutes prior to museum closing time. First departures: 10:30am regardless of the season. Last departures: 5pm in winter, 9:30pm in summer. We recommend taking the cruise in the evening time. We are comparing Eiffel Tower, Louvre and Seine Cruise Combo Ticket Prices from leading ticket suppliers and Try to find you Cheap tickets prices on the market. This tour allows you to see and experience top Paris landmarks and activities. With the voucher that includes visits to most important attractions of Paris, you avoid waiting in long lines and get into action right away. The voucher also entitles you to enjoy a 1-hour cruise on the Seine River. You can choose any time of the day for the cruise. This convenient package offers three essential Paris experiences. Thus, it offers a great value to everyone who wishes to discover top sites of the City of Lights and Culture. Your Experience With Eiffel Tower, Louvre and Seine Cruise Combo Ticket? Combine three top-rated Paris activities for a privileged price. You will get to see the most visited monument and one of the most popular museums in the world. 1) Enjoy a great exhibition about one of the most iconic symbols in the world. 2)Feel like your floating high above the ground as you stand on the transparent glass floor. 3) Admire panoramic views of Paris and the Ile de France area that surrounds the French capital. 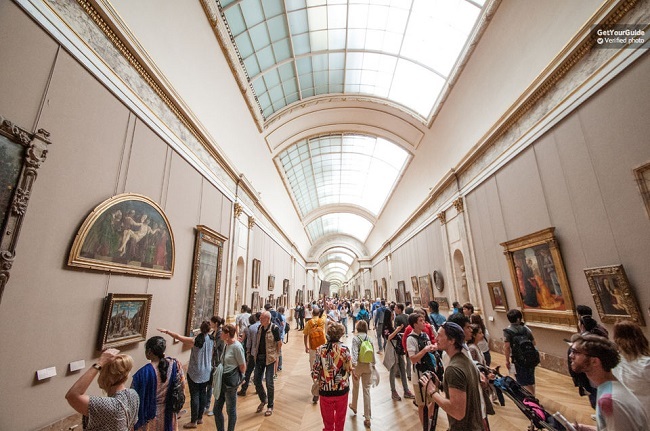 1) Examine masterpieces of art from around the world. 2) Tour the historic Royal Palace of the French kings. 3) Appreciate the artworks of the Greeks, Romans, Egyptians, Mesopotams and many other civilizations. While cruising along the Seine River, you will pass many famous landmarks of the French capital. What Eiffel Tower, Louvre and Seine Cruise Combo Ticket Includes? Priority entrance to the Eiffel Tower up to the 2nd floor (there are 3 floors in total). Accompanying commentary on board the cruiser. If you wish to visit the 3rd level of the Tour Eiffel, you will need to queue for an elevator on the 2nd floor. If you like paintings, visit the Paintings Gallery in the Denon Wing, Louvre. The most amazing display of sculpture awaits you in the Marly Court, the Richelieu Wing. Travelers Reviews about Eiffel Tower, Louvre and Seine Cruise Combo Ticket? Travelers who participated in this combo package have a high opinion about their experience. The tour has 4.7 (out of 5) on Get Your Guide and a perfect 5-star rating on Viator. This package has a 4.6 out of 5 rating on Get Your Guide. On TripAdvisor, the rating is 4.5. Past visitors to the ESB describe the views of the city as amazing. They also have a high opinion about the overall benefit of this package. Access for disabled people is available. You can bring either an electronic or printed voucher. All purchases are final, incurring a 100% penalty for cancellations. Tickets for the Seine cruise and visit the Louvre are valid for half a year. You can redeem your tickets at the Eiffel Tower only. Arrive at the designated point at least 15 minutes in advance. If you fail to arrive in time to claim your tickets, you will not be refunded. Yourslot to visit the Tour Eiffel cannot be changed. The Eiffel Tower is next to the starting point. Ticket Collection: 19 Avenue de la Bourbonnais. Duration: Flexible, the duration of the guided tour is up to 1:30 hours. Duration: Flexible, between 1 and 3 days.